They were apprehended at their hotel hideout in Rumuigbo. A statement from the anti-graft agency says they were arrested on Friday, February 1, 2019 in a sting operation. 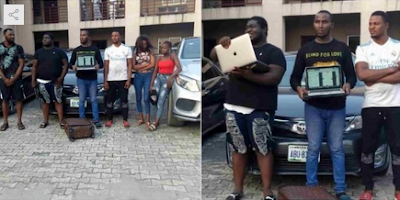 The suspects, comprising four men and two ladies are: Revelation Macaulay, Oghenekewe Innocent Akinnawo, Kemka Godseat Amadi, Damilola Adedoyin Oyinloye, Mary Ndubuisi and Jennifer Vandi. 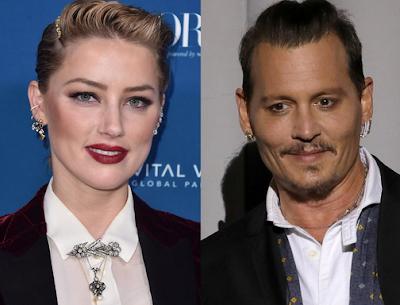 Their arrest follows a series of intelligence reports linking them to alleged fraudulent activities ranging from love scam on numerous dating sites, obtaining money by false pretences and other fraud-related crimes still being investigated. 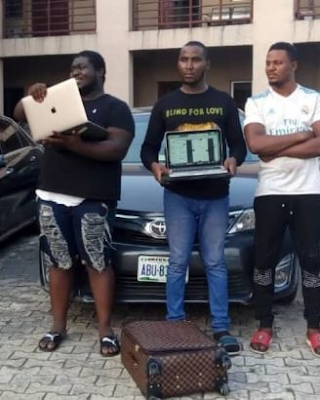 Several items were recovered from them at the point of arrest include three exotic cars: Benz- E350-4Matic, Toyota Camry XLE and Benz- GLE 450. 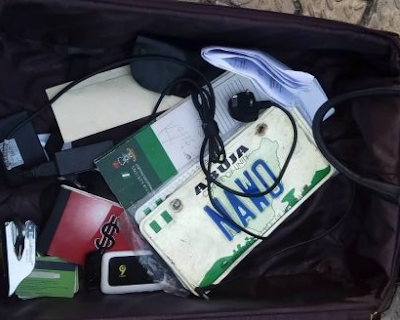 Others items include four iPhones, four laptops; one iPad, one iron sealed stamp; cheque books, car number plates and two un-used bullets.